NEW DELHI, April 4: Navodaya Vidyalaya Samiti (NVS) released the merit list of JNVST class 9 for selected candidates. The candidates with their name in the merit list, are selected for admission at their respective JNVs. Click on the link of class 9 select list. Open it and search for candidate’s name in the list. 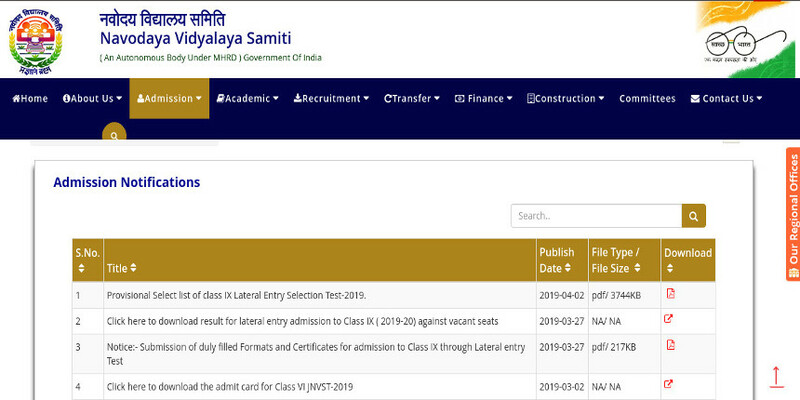 On March 27 the Samiti released JNVST class 9 result for all the candidates and with respect to that result this list is published to inform the selected candidates about their selection. Selected candidates will also be intimated through post or SMS. The parents of selected candidates will have to submit the admission form to their respective JNVs along with requisite fee. The forms should be submitted before the last date.